In a series of recent posts, (The Yahoo Pipes Documentation Project – Initial Thoughts, Grabbing JSON Data from One Web Page and Displaying it in Another, . Starting to Think About a Yahoo Pipes Code Generator) I’ve started exploring some of the various ingredients that might be involved in documenting the structure of a Yahoo Pipe and potentially generating some programme code that will then implement a particular pipe. …and then came a comment on one of the posts from Paul Daniel/@hapdaniel, pointing me to a pipe that included a little trick he was aware of. A trick for grabbing the description of a pipe from a pipe’s pipe.info feed (e.g. http://pipes.yahoo.com/pipes/pipe.info?_out=json&_id=eed5e097836289dfb4e8586220b18e0e. 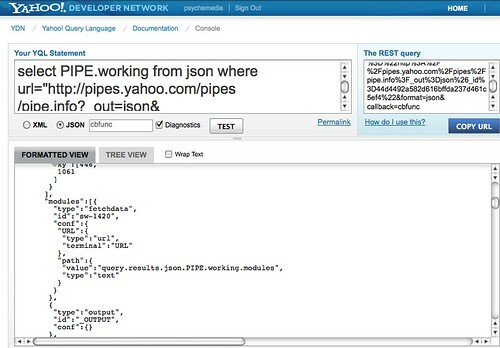 select PIPE.working from json where url=”http://pipes.yahoo.com/pipes/pipe.info?_out=json&_id=44d4492a582d616bffda237d461c5ef4&#8243;. The pipe id is the id of the pipe you want the description of. We can then grab the JSON feed either from YQL or the YPDP pipe’s internals pipe into a web page and run whatever we want from it. So what’s next on the “to do” list? Firstly, I want to tidy up – and further unpack – the “documentation” that the above routine produces. Secondly, there’s the longer term goal of producing the code generator. If anyone fancies attacking that problem, you can get hold of the JSON description of a pipe from its ID using either the YPDP internals pipe or the YQL query that are shown above. Previous Previous post: So What Is It About Linked Data that Makes it Linked Data™?